If there’s anything I love just as much as pancakes, it would be cashews. The only thing is that they are packed with calories. Let’s find out from Anthony Alayon, who I met earlier this year in Vegas, where they serve more than cashews…. Are you looking for a way to lose body fat naturally in the safest and fastest way possible? Would you like to learn 1 unique trick to start losing fat today? The advice I will be sharing with you goes against main stream believe and it tells you to do the EXACT OPPOSITE. So pay close attention. This is 100% absolutely FALSE! Fats are one of the three basic macronutrients needed for survival. So if you eliminate your consumption of fats, you will actually be causing MORE HARM to your body then good. Let me explain. 85% of our bodies energy comes from fats. So by eliminating your intake you will feel sluggish throughout the day. Now does it make more sense why you don’t have any energy when you try to go on a starvation diet? In addition, fats are ESSENTIAL to brain function, as well as joint function, hormonal production and many other important cellular activities. As a matter of fact, fats are so important, that your body can live without carbohydrates but it CANNOT live without fats. Cut the fats out of the diet and not only will energy suffer, as mentioned above, but your hormonal production will plummet and your body will interpret the lack of fats as an emergency situation and actually try to store fat. Now that we have discussed the problem…let’s jump right in to the solution. Saturated fats are mostly found in animals, eggs, chicken, steak, and pork chops. These fats do not yield the best health benefits as they are connected to a host of diseases. Too much of these fats can cause high triglyceride levels and are not as healthy as other fats. However, some saturated fats are needed for hormonal production so do not cut these fats out of your diet completely. (Tip: Just 1 whole egg for women and 2 for men per day will suffice to give you all the saturated fats your body needs). These fats are found in vegetable oils, such as corn, cottonseed, safflower, soybean and sunflower oil. Polyunsaturated fats also are high in omega-3 fatty acids which cannot be produced by the body and are ESSENTIAL for life. These are the fats that have good effects on your body. Monounsaturated fats help to keep cholesterol and blood pressure down. They come from virgin oil, canola oil, and peanut oil. They are much better than saturated fats as they are not linked to any disease from animals. Overall it is a good fat to take in and can help with muscle recovery. 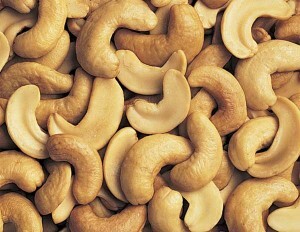 Cashews rock, fats rock and Anthony rocks for sharing this stuff. Anthony and I have something in common… we laugh at people who work their abs for 30 minutes or more. It’s politically incorrect, but true. There’s a better solution to find your abs, even during the busy holiday season. AND… you can build muscle, too. Anthony has it all figured out for you. Does he have anything to say about coconut oil? Being a different type of saturated fat….lots of controversy and confusion about whether to include it or not in your diet. I can certainly ask him to hop over here and chime in. I’ll shoot him an email and see. Thanks Dianne! One of the best sources of polyunsaturated fatty acids (PUFAs) is fish, and more specifically oily fish such as salmon, tuna, and mackerel. Fish contain both n-3 and n-6 PUFAs, offering a more complete array of nutrients than relying on n-3 alone. Not to mention, studies have concluded that a steady diet of fish (properly prepared) find that there is an as yet unknown ingredient in fish that provides many protective benefits against diseases such as diabetes, heart disease, etc. Consumption of fish oils alone cannot have not been shown to provide this protection. Newer research is looking at arginine content, a contributor to the nitric oxide pathway that is so important in keeping vasculature smooth and allowing for delivery of blood to the outer fine capillary networks. I like the long-windedness I appreciate the feedback Suzie. Great info!